at Accurate Woodworks in Morgan Hill, CA. works. Chubby Chassis did the chassis work and provided body lift framework. The roof assembly, tail and liftgates are set in place for a trial fit. Roof side rails need to be reshaped to conform. 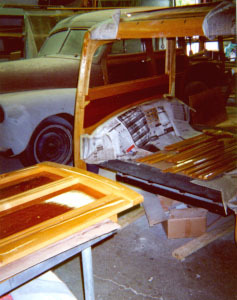 Here necessary modifications are made to the front header and the rear quarter window areas for a better fit. After several fittings, the roof contours now fit the quarter panels and cowl areas. The center door posts are installed and doors hung after hinge locations are determined. 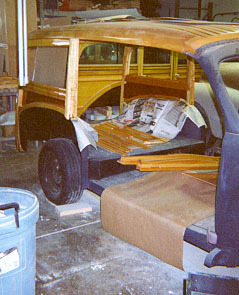 View of passenger side doors after final fit. 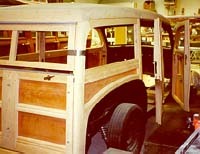 Drivers side doors trimmed and fit in place. The body is disassembled and varnishing begins. 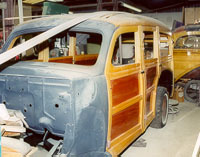 The roof and quarter panels were removed for varnishing, then reassembled. Varnishing is finished and the body is reassembled with new fasteners and blindnuts throughout. All inside brackets and hardware are painted and installed. The car is near completion.